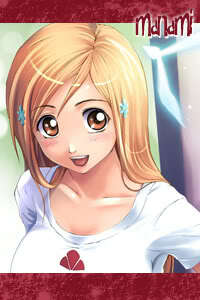 General Appearance: Manami is a buxom blond with fair skin, taking after her American mother. She has wide curvy hips with a smaller waist. Her fashion sense is superb – always on to the latest trends and styles. Babydoll shirts, cute little mini skirts, platform shoes, sparkling hair clips; these are all staples of her closet. When forced to wear a school or worm uniform, she’ll still jazz up her style with trendy accessories. Strengths: Dance! She’s super skilled on her feet, doing all sorts of dance styles. Her body is very flexible and bouncy. Weaknesses: Pushups, pullups, anything where she has to use strength in her arms. Current Goal/Purpose: Survive her new school. Normally, that’s no big deal, she’s totally used to moving around… but this place is soooo bizarre! Talents: Fast talking and charming anyone with a pen-…anyone that has eyes! Fears: Public Embarrassment. Really, how do you survive after something like that?! General Personality: LIKE OMG HIIIIII! Manami is a bubbly socialite. She loves being around crowds of people, being in the middle of some sort of excitement whether it’s super fun or even a huge drama. A little chatterbox, she’s also spends a lot of time gossiping, chatting on the phone with her seemingly limitless contact list of friends, or butting in to someone else’s business. Manami is guilty of having twenty crushes at once, and even getting a little out of hand at boy-stalking when there’s a guy she particularly likes. Overall, she’s a good friend and always willing to back someone up when they need it. Inner Personality: There’s very little about Manami that she isn’t willing to share with everyone, even when it’s not asked. In fact, she has a bad habit of sharing TOO MUCH. Manami wants very much to be liked and fit in to whatever new place she’s in, so she offers as much of herself as she can give, in hopes that everyone will see something they can related to and give their friendship back. This seems to be working for her, despite her occasional obnoxiousness, as she’s so very genuine about wanting someone’s friendship. Secret: Manami has no secrets… so far! General History: Manami was born to Akihiro Shinobu (a world traveling linguist born in Japan) and Linda Lewis (one of the rich and fabulous New York socialites), while on a cruise ship during one of her parents vacations. Mr. Shinobu, being such a brilliant mind with languages spends much time traveling the world studying, teaching, and doing translation work in different countries. He met Linda Lewis while in Washington at a random big-wig party. They try to say it was love at first sight, but it was several meetings on down the line before the pair started dating and eventually married. Loving their around-the-world lifestyle, even after Manami was born they didn’t slow down their travels. Europe, Africa, Asia, the family rarely spend long than a year or two in a single location, making it hard to Manami to settle, and even harder to leave once she made friends. She spent most of her younger years with tutors for her schooling up until she was old enough to start High School. She spent her first two years of High School in Los Angeles, California while her father was a Linguist teacher at a college. Present Life: Akihiro was recently offered a superb job in his home country of Japan, where he has moved his family and enrolled Manami in Chikushi High. This latest move was a little unsettling, after she was finally so well adjusted to life in America. This new school seems kind of scary, and even worse… she’s discovered her Japanese is awful. He father is soooo embarrassed (He’ a linguist, his own daughter should be good at languages! Even worse, it’s half her heritage! )… and she’s just hoping she can make a good impression and make her papa proud! - Manami was born on a cruise ship! - Lots of moving around the world for several years! 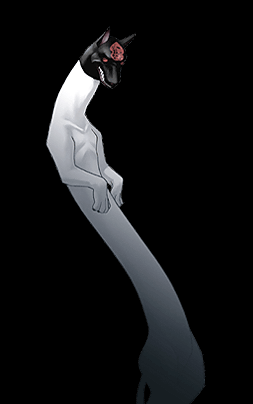 Charlie: The inugami that haunts Daiki's home. The general belief is that an inugami is created by burying a dog up to its neck and placing food around it, which it cannot reach. It would take days for the dog to die, and during this time the dog's master would tell it that its pain is nothing compared to his own. When the dog dies, it would become an inugami; since its dying wish would have been to eat, the food placed around the corpse would act as a placatory offering, and thus make the spirit obedient. A more specific legend states that Daiki's old grandmother desired revenge against an enemy buried her treasured dog in the ground with only its head sticking out, and said "If you have a soul, do my will and I will worship you as a god." She then sawed the dog's head off with a bamboo saw, releasing the dog's spirit as an inugami. The spirit did as she wished, but in return for its painful death it haunted the old woman. Takahashi Daiki: Daiki pretends to be a student at Hotaru's high school. To most of his teachers, he seems rather aloof to the world around him and is constantly distracted. However, that being said, he maintains a solid "B" average in school, meaning that he is smart. Daiki is popular amongst the girls of his class, though he expresses little interest in them. He spends most of his time with a white haired girl named Irene in the drama club. On Hotaru's first week of school, it came under attack by Anglova's demons. Daiki ended up saving her because he believed that she had hidden magical potential. She had little clue as to what was going on. He was wearing a mask to conceal his identity but removed it in order keep her relaxed. Daiki is in fact a Japanese magi that works for a secret society called the Organization. Unlike the Flowers, he retains all of his memories because he has supernatural origins, his ancestor was Tamamo-no-Mae. She was a beautiful woman who served Emperor Toba and was said to be the disguised figure of the white-faced, nine-tailed fox. Working in the palace since 18 years-old, she later became a court lady of Emperor Toba under the name of Tamamo-no-Mae. She was said to have gradually gained the favor of Emperor Toba with her beauty and extensive knowledge. She was said to have the looks of a twenty year old. There are many theories, but later she was driven away from the palace when her identity was exposed by a Onmyouji who investigated and identified her as the cause to why Emperor Toba had fallen seriously ill. After leaving the palace, she built a bad reputation in the fields of Nasu and had to repel an subjugation army of 80,000 men dispatched under the Emperor's order. Daiki has issues with this fact and therefore doesn't bring it up often. Daiki's partner is named Irene. She is a demon that is trying to reform. The two bicker a lot but have a strong friendship. Irene is an enigmatic girl, supposedly attending the same high school as Daiki and Hotaru. She has long, white, wavy hair, with straight-cut bangs which she pulls back into a ponytail. 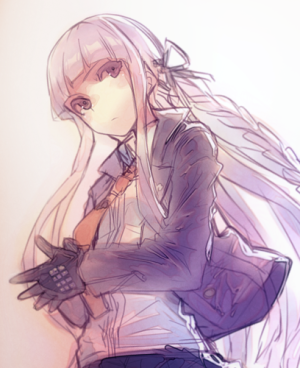 Her taste in clothing is conservative, tending towards jackets or vests paired with long black slacks. She also wears reading glasses, although she has no need for them, because she likes the way they make her look. No one has ever seen her attend class, so many students aren't sure what to make of her. She's suspected of being a delinquent as well as a foreigner, despite her elegant appearance. Irene can be somewhat snobby and difficult to read, but her heart is always in the right place. She has a weakness for cute men and keeps a little black book that contains a photo, name, contact information, and a list of stats/interests for every young man she meets. Supposedly, Daiki is the only one who hasn't made it in there. Her various "loves" are the victims of stalking and covert photography, but Irene has yet to date a single one of them. She is, however, ridiculously possessive and has been known to scare off girls who approach one of her claims. Despite all of this, she constantly puts Daiki down for flirting with other women. Her sense of humor runs toward smug and dead-pan. Occasionally, she exhibits bizarrely dorky behavior, such as a fondness for old detective stories. She can also be very meticulous and is quite precise about having things the way she likes them. Her true identity is Stheno. Of the three Gorgons, she was known to be the most independent and ferocious, having killed more men than both of her sisters combined. When Medusa was cursed by Athena because Poseidon took favor with her in the Temple of the goddess of wisdom, she stood alongside her sister and so shared in her punishment. Irene had spent centuries in slumber before she was awoken during World War II by the German invasion of Greece. In response, she leveled much of Athens, believing that this was Athena's doing. After getting stopped by a strange wizard with a scruffy beard, she decided to join the Organization since she honestly had no desire to continue fighting after 2,000 years. Many members of the Organization still distrust her, however, so the leaders of the Japanese branch finally offered the services of Daiki. Because he has kitsune origins, he is immune to many of her spells. They have been partners ever since. Kaichou is an undercover agent for the same organization that Daiki works for. However Tamotsu has his own methods and goals. At school he is a quiet type, running form class to class with an armful of books and his glasses pushed high up his nose. Despite this hes won class presidency and performs the relate duties with an uncompromising air using careful scheduling and a surprising knack for getting his hands dirty to organize class projects and activities. Outside of these however he more often than not has his nose in a book and a pencil in his hand. Race : Formerly a human, but is now a living mass of chaotic matter analogous to a primordial soup, created from the accumulation of the forms of demons, humans, and other beings. Soul Transfer: The simplest way to explain is that he has the power to take the form of any being, whom he has absorbed. It is not always a trustworthy spell to use because it is random and since he has no idea of all the beings he has absorbed over the years, he could turn into a weak child. It is said that if he can unease all the souls inside of his chaotic form, he can form several larger forms. Spiritual Arsenal: Since Anglova lacks a proper body anymore, he has limited control to shape the element into physical forms and use it as a weapon. He generally likes to use this chaotic matter and form it into an imprisoning mass. He may have secretly split into multiple copies of himself with all that extra biomatter. Though the copies can't survive long without losing thier forms and becoming puddles of goo. Weaknesses : Anglova has a fear of stag talismans. A mage battled him in the 1500s, using this seal. Stags seem to be the only beings that he cannot absorb. These talismans will not kill him. The only way to do this is to use a purifying spell that no human demon hunter can use without giving up their life in return. Personality : Anglova in his life time was considered to be one of the top Alchemists, so he is a man of great knowledge. However, his personality is known to be chaotic like his form, due to the fact that he is nothing more than a collective conscious for all the souls he absorbs. History : Anglova was once a Russian alchemist. Always fearing death, Anglova attempted to attain immortality. Anglova found a mysterious pool of "protoplasm" in a cave. Immersing himself in it, he is transformed into a malleable clay-like form which could be shaped into almost anything he desires. This was only a temporary effect, however, requiring him to return to the pool periodically in order to maintain use of his powers. He eventually copies the pool's protoplasmic jelly by alchemy studies, although the artificial proptoplasm only allowed him five hours of powers compared to the full two days of the pool's. This proved to be too much of burden until he mixed other being's flesh into the mix. As time progressed, the protoplasm and biomass mix he was studying did not interact well with his human genetics and soon his body became a sole accumulation of lives with a collective consciousness. By Organization standards, he is considered a demon. However, they have no rights to work within the Russian borders; making it impossible for them to go after him. He remained a reoccurring issue in Russia until the start of the Afghan War in the late 1970s. The Soviets had created a series of modified soldiers that proved capable of withstanding some of his powers. He remained hunted for several decades before he slipped in China and then on to Japan. While he knows that Japan has an Organization front, much like the Soviets they prove too weak to defeat him. Personality: She is earnest, single-minded, and tries her very best. Her spirit is high, as is her cunning. Her affection levels are average, though she can “read” her master’s personality very well. Hana can be considered pure but she has some dark and dangerous personality traits. 1: She has criminal tendencies: she likes stealing things. 2: She has an overactive imagination. 3: She is emotionally detached at times. 4: Something about her is absurd: she was turned into a cyborg by an evil society and her body may have special properties. 5: She has a secret job: she is a cold-blooded assassin. Roots: Her family was in heavy debt and she works in the mansion as repayment. Weapon: She has a machine gun hidden somewhere on her person. Alias: Know by most as Number 7/Nana by the Fuiku family, sometimes calls herself Maid-chan. Place of Birth: Motododo-Hokke, Japan. Current Residence: Originally the Fuiku mansion. Now wanders the streets. Occupation: She was the main guardian of the Fuiku’s youngest daughter named Chiba. However she was exiled by her young Mistress after stealing some food. Since that time she still dubs herself a former representative of the Fuiku family. School/Grade: She has a high school level education. Family: It’s assumed that her family is still alive but her past memories were wiped away by the Fuiku’s after her conversion into a cyborg. Gemstone: Sapphire. The properties with which the sapphire, the birthstone of the Zodiac sign of Virgo, is associated are as follows: Truth, sincerity and constancy. As well as, clairvoyance, insight and interpretation. Hair: Dark brown, almost black. It reaches down to her hips. Eyes: Red, probably due to the conversion. These are not her natural color. Distinguishing Marks: The machine that was placed over her heart that helps to control all of her implants and controls the memories that she no longer has. General Appearance: She attempts to always look posed and regal. Even though she has been booted out of the Fuiku mansion, she is almost always seen in her maid uniform. It’s unknown how it stays in good shape since it’s her only clothing available to her at this point. Strengths: Since she is a cyborg, she can perform feats considered impossible for normal humans like jumping high and packing a powerful punch. However, she is not a very fast, which is why she tries to fight at long range vs. close range. Weaknesses: Even cyborgs are not without certain flaws that leaves them vulnerable. Since the modifications that she has received are generally man-made, there are usually some limits to the extent of what she can do. Unless she is upgraded over time, her power does not change, meaning that her attack patterns are very predictable. Multiple encounters and her foes might be able to overcome her. Since her brain remains organic, if that is cut off the body she is is useless and she could die. Enemies: The foes of the Fuiku family. Aspirations: She would like to better herself since she had been helped by a person that was able to upgrade her body. 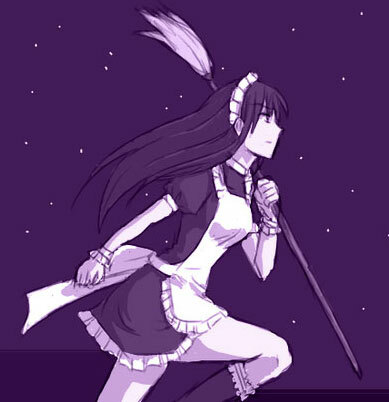 Her main goal for now is to try and find another maid that was named Roku/Six since she was the only other maid to successfully escape the Fuikus. Hobbies: Hana enjoys putting things together, from cabinet making and woodwork to puzzle building. She is great with details and enjoy painting, music and knitting. Dislikes: Hana dislikes anything that can be hazardous to her health, such as certain foods or being unclean. She also highly dislikes anything she considers sordid; this includes sloppy workers and squalor. Her least obvious dislike is being uncertain about herself. Inabilities: Her weakness is stealing food from the family. She normally has never been caught but now that she has, she has been booted out. Hana is extremely fussy and is a worrier. She conceals too much of her emotions, to which she is afraid of giving way because she does not trust others, nor does she have confidence in herself and her judgments when it comes to her personal life. This is because she is conscious of certain shortcomings in herself of worldliness, of practicality, of sophistication and of outgoingness. Hana is overcritical and harsh when it comes to dealing with people she dislikes. Fears: Facing the reality of her imperfections, being useless and unneeded. General Personality: Can be viewed as an old maid at times. She is intellectually inquiring, methodical and logical, studious and teachable. She is often defensive about her overall personality and is only open when she chooses to be. Inner Personality: Hana can be sensible, discreet, well spoken, wise and witty, with a good understanding of other people’s problems which she can tackle with a practicality not always evident in her own personal relationships. She combines mental ingenuity with the ability to produce a clear analysis of the most complicated problems. She has an excellent eye for detail. Fondest Memory: Anything she has a successful mission against the foes of the family. Biggest Regret: Eating that bloody tart. Secret: That she is not as ‘human’ as she tries to be. Special Items: She has nothing on her at this time. Weapons: She knows how to handle machine guns. 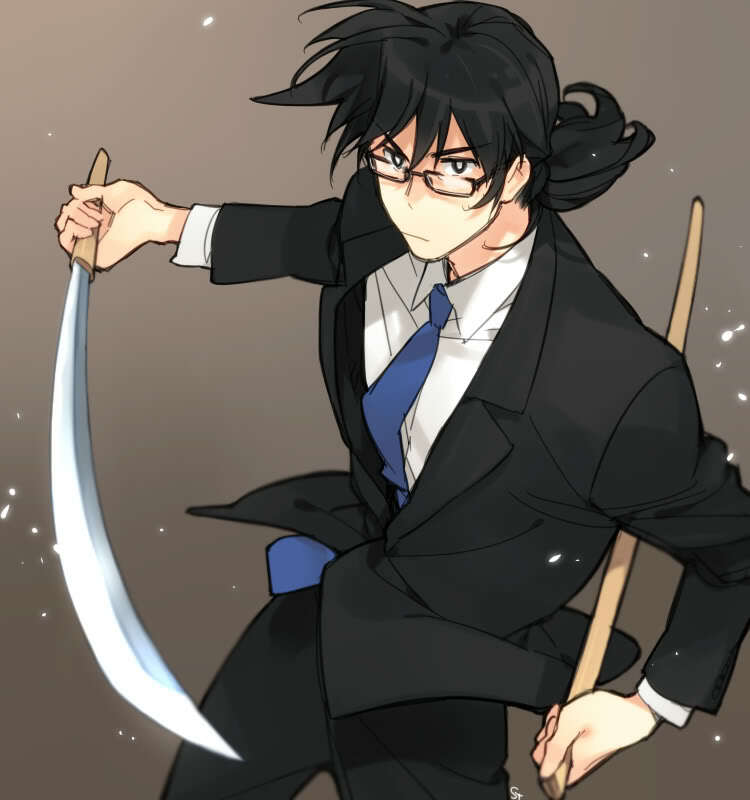 Hana can also use mops, brooms, and other items as efficient melee weapons. If push comes to shove, she can always punch someone. General History: Her past is unknown. It is rumored that her family was in debt to the Fuikus and Hana was taken as a payment. Since the Fuikus are connected to a movement simply called the Organization, they have access to many supernatural and advanced sciences. Because of that fact, their maids and butlers are actually a professional team of soldiers and assassins. Hana was most likely turned over after high school and her memories were erased when she was converted into a cyborg. Any traces of her past, even her true name of Hana are unknown to her. Present Life: She was the maid and mentor of Chiba Fuiku, a bratty teenage daughter of the head of the clan. While Hana never really liked Chiba, she did as she was commanded. One day she stole some food that was supposed to be for Chiba’s birthday. In a temper tantrum, Chiba ordered Hana to leave. Hana did as she was ordered, as her programming made it difficult to resist such an order. She is now out on the streets of Japan, wandering around trying to find a way back to her family or at least a new job. OTHER: This is tattooed up both of her arms. COMMON OUTFIT: This is her most common wear in everyday life. This is her riding jacket. It is a combination of leather and mesh, allowing for free movement but still keeping her safe from the elements. Her pants are made out of the same material that any modern soldier wears, being both light weight and durable to the elements and high speeds. Her helmet was a gift from her father before he was killed in combat against the Japanese mafia. Garnet was born in the Mountainous regions of Thailand. Her father was a Chinese immigrant on run from the British that were stationed in Hong Kong. He belonged to a mercenary group called the Company Store. Garnet was raised on the run, so she never had a formal education in an established school. In the early 2000s, her father was involved with various rebellions in Asian nations, especially the underground resistance to the Communist Chinese in Taiwan. This forced them to live life on the lamb. That was until they stumbled their way into the Beowulf Mercenary Corps located in Port Jutesford. Without a formalized military, her father had her trained in various combats but it was the motorbike that she excelled at. During the coupe, Garnet decided to side with Amara Nevalia, chiefly due to their similar interests. Garnet is well read, meaning that by stealing book as a child from the patrons of her father‘s involvement in the Thai uprisings of the early 2000s, Garnet learned to read in this fashion. The Company Store, turned a blind eye to this fact. The reasons for this are personal and thusly she never talks about it. Garnet uses her Motorcycle as her chef means of combat. The bike has 20" front and rear tires, and is powered by a high-performance, water-cooled, single-cylinder engine - geared toward the lower end for faster acceleration and there are no exhaust pipes. The exhaust is routed through the hollow steel/aluminum/magnesium tubing used for the frame of the bike. The rider's body is protected by shields. It is about 10.5 feet (3.2 m) long and her max. speed is Of 0 to 180 mph (290 km/h) in 6.9 seconds. There's a central computer on the tank that supplies an LCD announcement containing additional information for the driver. As a rider, she has a good sense of balance and tends to have better spatial judgement than most. Which allows her to ‘flow’ with her bike with great ease. Garnet’s greatest weakness is that her sole means of combat is her motorcycle. Without it, she fells like she is missing a great part of her own soul. As well, her over dependency on the bike makes it difficult for her to go into rocky terrain and other places that make road travel virtually impossible. When in hand to hand combat, she is armed lightly and needs protection from others if she is to defend herself properly. Race: From another time and era from the rest of the cast, Jin comes from a race where humanoids have transcended the physical body and mind. This makes her Ethereal and is a higher spiritual being. Her race is called the Shinzui and lived in an area that was a lot like Early Middle Ages Japan or China. At birth, their minds are altered to only have the desire to work and the most primitive regions of the brains that allow them to again access to the Five Gogyô. This makes most of the Shinzui to be android like and lacking what is considered to be normal social skills. If they do not have an assigned job, they will go out of their ways to find one. Personality: Sozzie is a self-absorbed student/scholar that dwells more on studies than having much of a social life, one could easily call her an over-educated elitist. One day she wishes to emulate the knowledge of her parents. Sozzie is mostly driven by her youthful desires to copy the actions of her heroes. She wants to help change the world for the better. She also has a constant longing for egg rolls. Drivers: Learning and expanding her mind. She survived the literal ending of everything to witness rebirth, on this end she is always willing to gain more knowledge in all walks of life. If not yet, then finding the best egg rolls in all of Iwaku. Equipment: Scroll paper and ink kept in a side bag. Strengths: Leadership and command. Although often considered a “machine over a human,” she is well respected for her knowledge. Weaknesses: Her body looks like it is that of an ordinary human being, but since she is from a tribe of long forgotten ethereal beings, she is less likely to sense changes in the area,. This can cause stress to her mind because her race needs time to react to quick changes. If not, she can get a sensory overload to her mind, causing her to become disinterested in matters that could prove fatal to those around her. Chi: Represents the hard and physical aspects of the world. This allows Sozrosse to use hard or heavy objects that she wouldn’t normally be able to carry. However, the time is limited to a few mins and this gives her risks when carrying heavy weapons. Sui: Represents the fluid, flowing, formless things in the world. This magic allows for Sozrosse to form barriers. Since the spell is using her own ethereal mana, it is a risky spell to use for long periods of time. Ka: Represents the energetic, forceful, moving things in the world. This allows for Sozrosse to use the body heat from those around her to form flame spells. She cannot use the spell for long periods of time because it can cause harm to people surrounding her. Fû: Represents things that grow, expand, and enjoy freedom of movement. Sozrosse will use this with a combo of the Mind Meld. Mentally and emotionally, it causes an "open-minded" attitude and carefree feeling, making the receiver’s mind weakened. This spell is best used only when, she knows that she can count on an ally to take the opponent out. Kû: Represents those things beyond our everyday experience, particularly those things composed of pure energy. She can shoot out bright blue lights from her body to act as a distraction or at times like a laser beam. This is the power that she is best versed in and uses it the most often. Secondary Power: Mind Overclock, Jin’s secondary power allows her to forecast future events, hers only, through mathematical calculation. As with all forms of forecasting, details only come in the form of complex numbers or images, making it impossible to form a completely understandable “prophecy.” She can also "split her brain" allowing her to run it in a parallel manner by separating her thought process, which allows her to maintain photographic memory, so much so she could be considered a living computer. Tertiary Power: Hurricane’s Dance: Jin’s self defense movements. It is a strong style characterized by bold forward momentum. Jin maintains a low stance and moves in wide arcs, the inertia of the entire body lending force to attacks. Opponents are hard-pressed to maintain their ground in the face of such an all-encompassing onslaught. Background: Sozrosse was the last student of CoffeeCakeSadist, a well know mentor of many historical figures. She was chosen by her fellow reality benders to be a recorder of history due to her ancestry and high magical potential. At the age of 12, she underwent an operation that made her a "grown-up," which suppressed her will to question events going on around her. CoffeeCakeSadist did his best to counter act this action but was unable to do so. Instead, he focused on training her to be a sage like being, much like himself. She became fairly aloof to her fellow beings unless it involved research. In more recent times, she has focused defeating demons. Aya is the mentor that the Organization assigned to Daiki for training as a Demon Hunter. ]She is a well received magus that has studied the history of kitsunes and their fox magic. While she was able to teach Daiki how to use his fox fire and some other basic kitsune tricks, it was impossible for her to properly train him on how to use his magic to transform into a fox. Her personality is one of two extremes. The first is a lovable snarky older sister type. She loves to tease Daiki and often will call him Dai-Dai, to annoy him. Her other personality is blind disdain for rogue demons. Her main weapon is a boy and arrow and she will freely slaughter off demons if the are a harm to humanity. She is also very flirtatious and has a thing for teasing adorable teenaged girls, the only one she avoids is Irene. Either way, she a romanticist at heart. Spiritual Bow Construction is her main special ability. She can create and fire arrows of spiritual energy made from either her or others for great damage. Aya can use her arrows to heal rather than harm at times at well, though this is uncommon for her to do with anyone but Daiki. What makes Aya-sensei a high value to to the Organization is that, she is at a high level with her abilities, so she can use the celestial elemental known as aether to construct arrows of unbelievable power and effects against demons. The drawback to this; however, is that she'll use up a lot of her chii after several uses. She loves new things, and she will tinker restlessly with things in which she is interested. She can also be called a speed demon. While in combat, she works with the Viking god Thor. Since many ancient deities no longer have the same powers as they did back in their heyday, some have joined the Organization in order to make a living. He and Aya get along well; though his constant love of modern foods can be a problem. The Norse gods' world exists in parallel with our own – where any train station in Scandinavia is, so is Valhalla. Therefore, it is still not uncommon for the Norse gods to show up in the modern world. A strong willed, trustworthy man who learns to come to terms with his troubled past and adapt to his role as a leader. He pretends to not care about the welfare of others while secretly doing his best to not let anyone down. He maintains that all he wants is to be left alone, meanwhile striving to gain recognition. He is a loner of sorts but will never turn anyone away if they are in need of him. Thor is a member of the Aesir, the tribe of Gods worshipped by the medieval Scandinavian pagans, and some modern nutters. Thor is the defender of the Gods, and the strongest of all of them. In the myths he is mostly fighting giants. He is described as red-haired and bearded. In the Norse myths, his character is strong, loyal and honest. He is often quick to anger, but also quick to regain his temper. However, he is not renowned for his brains, and so has to rely on brawn. One of the myths tells how this does not work for him, when he visits Loki and is tricked again and again. Thor's main weapon is the hammer Mjolnir. This was made for him by the dwarfs Brokk and Eitri. He also has iron gloves and a girdle that doubles his strength. He drives a chariot pulled by two goats and it is the rumble of the chariot wheels in the mountains that was said to be the cause of thunder. Lightning was believed to be the sparks from Thor's hammer, or from the piece of whetstone stuck in his head after his duel with the giant Hrungnir. In modern times, he volunteers for the Organization to fight any yokai or other demons that try to invade the human world since he views him as being types of giants. He was paired with Aya since they both have zealous personalities but somehow manage to cancel each other out. Thor has developed a love of modern day food but still loves to drown things out with mead. Vikki Baez is a teenaged woman that lives in the southwest of the United States in a city called Oscuro. Her father works at New Jerusalem University, where he secretly studies the effects of science on supernatural beings. This is unknown to her; however. Vikki’s mother divorced her father several years ago and Vikki keeps little contact with her since she’s never gotten along with her. Her elder sister is currently taking credits overseas, in Paris. Vikki has always wanted to travel to France and it is more than certain that she is jealous of not being ‘able to go on an adventure.’ She currently attends high school. Her mother’s ancestry has a long history of using fire manipulation, the power to generate, control or absorb fire. She can excite or accelerate an object's atoms, increasing its thermal energy making it ignite, not necessarily objects, but also air particles. When relaxed she can control and move the flames, including the shape, heat and even color; that said, pretty much everything with this power comes down to: burning. This is a very aggressive power as well as one of the strongest, allowing several powerful attacks, but it is some ways the most vulnerable as well, given than fire doesn't exist in itself and needs other elements. A plucky girl. If life throws hardships at Vikki, she’ll keep on smiling even though she knows things aren’t going her way. She has great charm, allure, and inner strength, and is able to overcome most any obstacle in life. She comes across as self-confident and self-possessed and others are drawn to her for that reason. There is a mysterious quality about this girl, because she is intensely private, discrete and secretive. Soon Vikki will learn everything about you, but later you will realize that she hasn't given you many details about herself--that's her natural reticence. Determination and will power are her basic personality traits. She can use them anytime to come out of anything that is negative. Vikki tries to explain everything as rationally as possible in her mind, though she often times gives up and just goes with the flow of life. This is because Vikki is naturally curious, Vikki loves to learn everything she possibly can about, well everything. She has an active imagination and likes to take risks. Vikki is not afraid to get dirty either. Vikki has a sense of fairness and justice. The same goes for generosity also. If you do one kind deed for her, she will do four in return. She is passionate with everything that is related to her. It is almost impossible for her to have neutral feelings. Either she will deeply cherish or fiercely hate. If any of the feelings are not experienced, she will become completely indifferent towards it. However, she never lets these feelings show. Her expression will always remain neutral, betraying nothing. Her anger is very bad and it's better to get out of her way when it gets out of hand. She can become a hard-hearted sarcastic person when angered. She seems to be very practical, but inside she is very emotional.